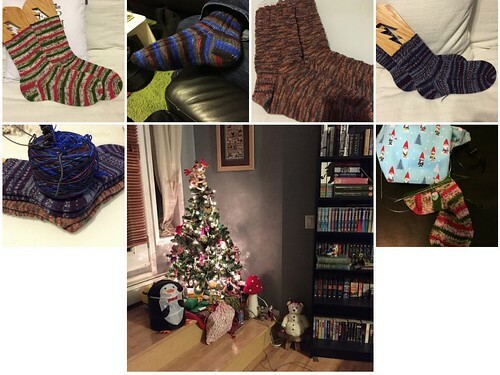 This was the Christmas of socks! The socks along the top of the mosaic are in order: mine, my husband’s, my dad’s, my mum’s. They’re in reverse chronological order, as I did my mum’s first, then dad’s, and then those two got packed up in a parcel and mailed off. Then I did hubby’s, and managed to finish them completely before he got home from school, so I didn’t have to do any sneaky knitting at home! My pair I started December 18th and finished on Boxing Day. 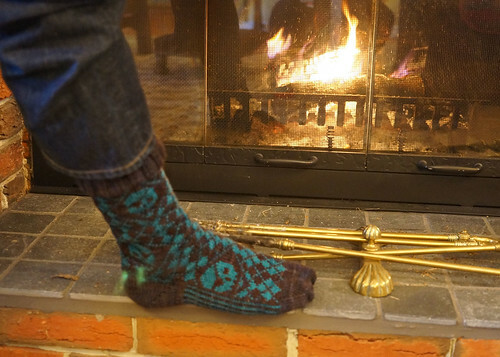 All the details are on my Ravelry project pages, here is a link to a page of all the socks I’ve knit! And I’m extremely happy to report that everyone’s socks fit well! 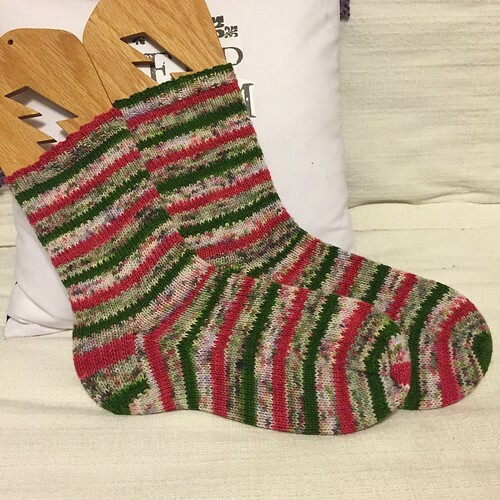 I’m really hoping to knit a good dent into my stash of sock yarn in 2015 – I finished 7 pairs in 2014, and this year I’m hoping for 12. 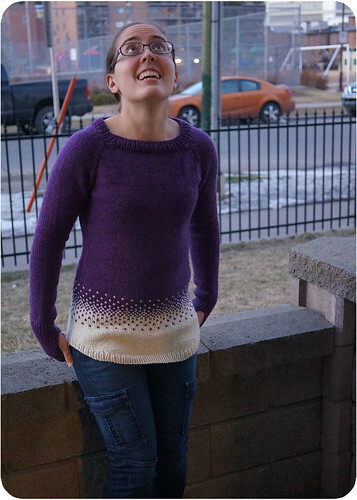 I finished that second purple sweater a couple weeks ago, but it wasn’t without troubles. There was a lot of seaming. And once seamed, there was the trying-on. This sweater was about 4″ too long when I tried it on. But I could see that I liked the shape of it, and I wanted to be able to wear it eventually, so I ripped back. That wasn’t one simple step…. 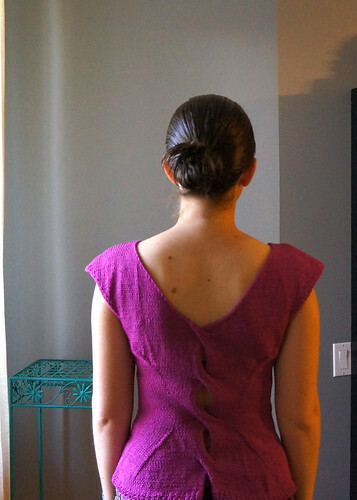 I had to undo the side seams I’d put in – luckily I had started to realize how long it was, so I left the ends hanging for easier pulling out of that. 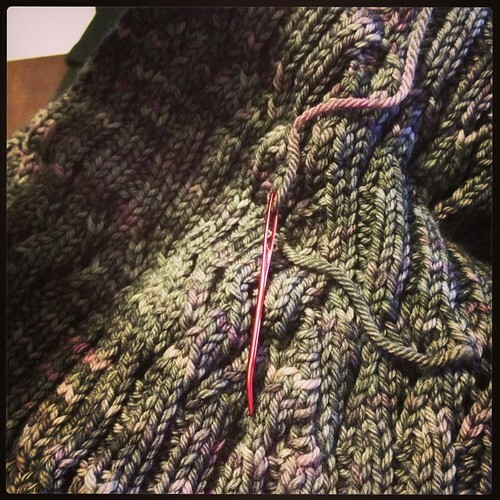 Then I ripped back from the bind off end – nice and easy. I ripped back about 6″, stopping at a ribbed section, then added more ribbing on to that section for about 2″. Easy. Then I had to make the other side match. 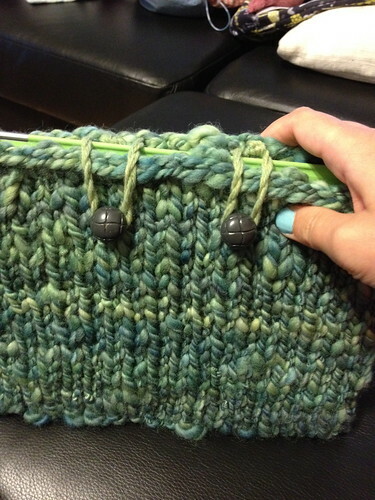 That side was the cast-on side, and knitting does not pull out in that direction. I picked out the cast on and about a row and a half more before I gave up and just took some scissors to it. I cut in the middle of a rib section, thinking it’d be easy to make sure I had all the stitches, then I could continue ribbing. But, because I was now knitting in the other direction, everything was half a stitch off. So I tediously pulled out to the last row of the previous lace section, knit a row to get settled, then did the 3″ of ribbing. Then I got to re-sew the side seams and weave in the ends for real! I started a podcast! 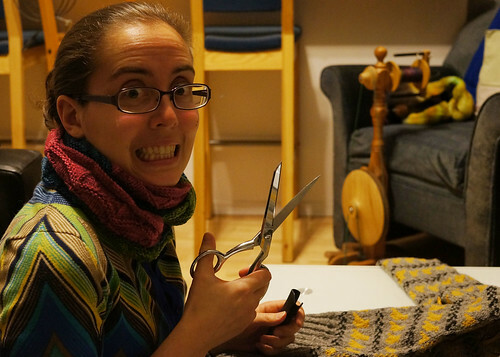 It is called Knitting Go!, and it is on iTunes, and has its own blog. I wear the sweater in episode 4. 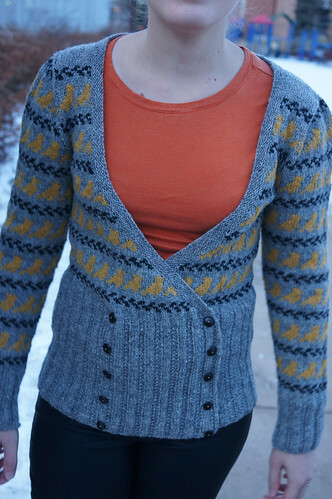 More details on the sweater can be found here. when everything around is brown. 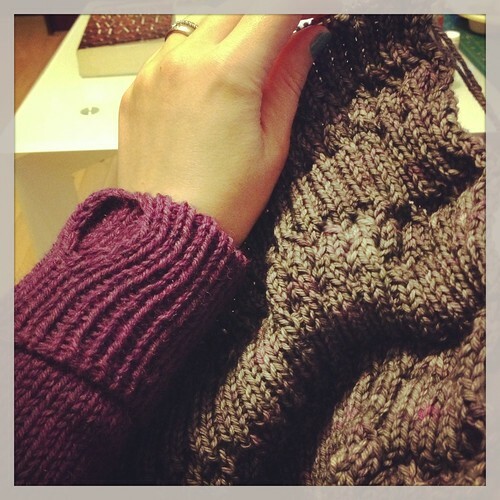 As soon as I finished that purple sweater, I started knitting a new one! I even knit part of the new one while wearing the old one. 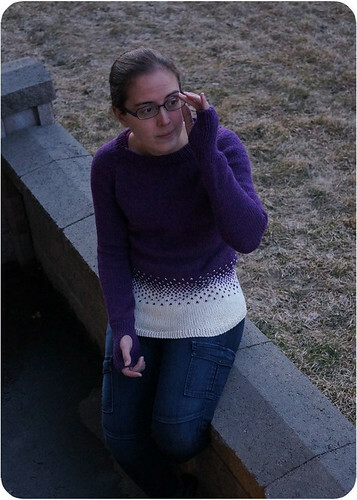 And with the snow we’ve been having, I’ve been able to wear the purple sweater a few times too. The new sweater is Slope by Cookie A, and is not constructed like a normal sweater. It is basically a giant rectangle that goes up your front, has a split for your head, then down the back. It is flying along because there is no shaping to worry about, just a rectangle. 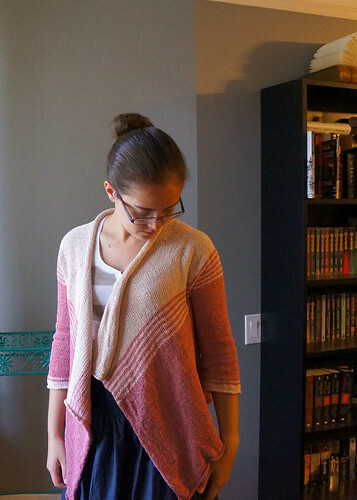 It is going to end up being an asymmetrical sweater, the sleeves are two different styles, and the action of one pulling more than the other means that the hem ends up on an angle. I’ve shied away from asymmetrical sweaters before this, because I’ve always worried about people saying ‘shouldn’t the buttons be in the middle?’ ‘That sleeve is different than the other one…’ but I’ve finally decided to try it, mainly because I couldn’t get this sweater out of my mind. 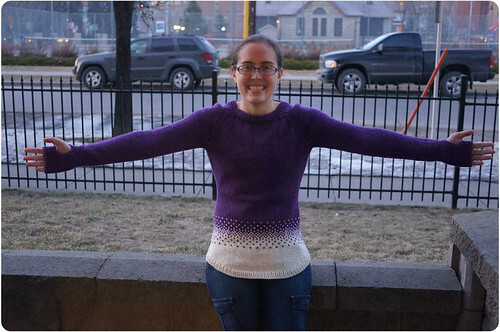 I finished my Katie/Gradient sweater! It fits perfectly, it is cozy and comfy and has just the right amount of ease so it feels like a comfy sweatshirt, but is so much nicer. I’m loving the big contrast between the two colours, too. Deep purple and creamy white, yum. 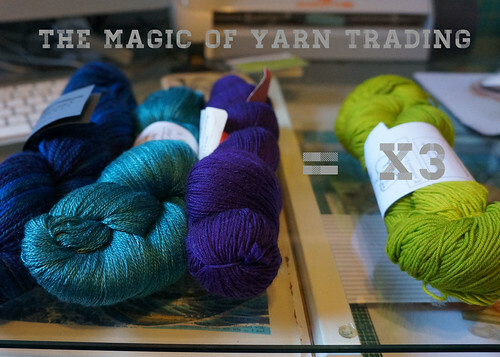 Both colours are by Cascade 220. I’m glad P likes playing with the camera, because I keep making him do sweater photoshoots. We took these just as the sun was going down, which I think worked out quite well. He kept posing me, tucking in the tank top straps that kept peeking out. I just wish I was a more patient model! 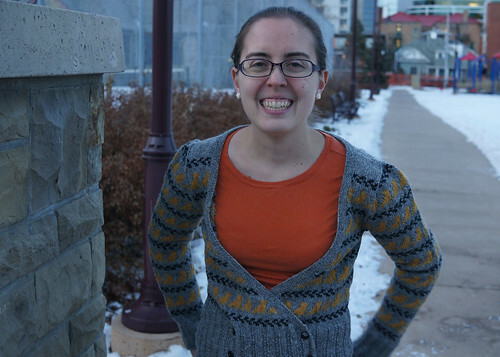 I was getting a little chilly outside, yes, even in my wool sweater. I love that this sweater has thumbholes. They keep my hands so cozy! I think I may go put it on again to hang around the house in. 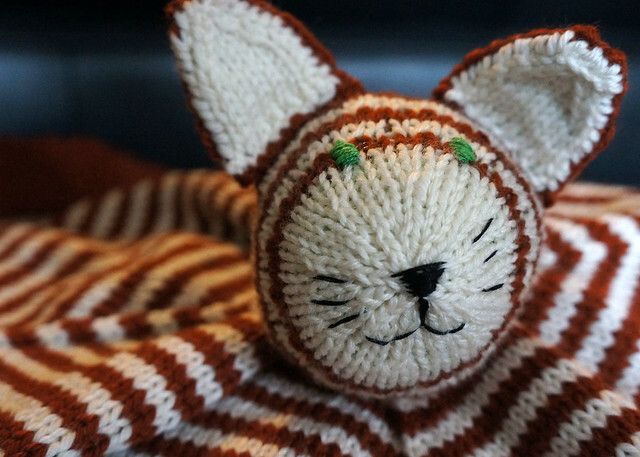 So many people I know have been having babies lately, and of course, I feel compelled to knit them things. 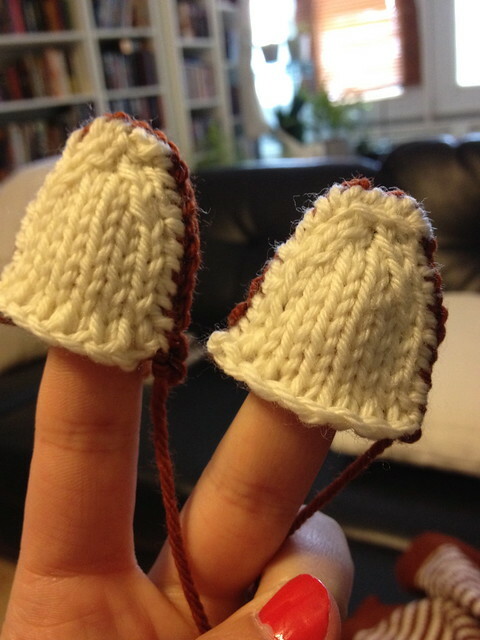 A couple years ago, I knit everyone booties. This time around, I decided to go with sweaters! This one was for a baby boy named Simon, born in August. I think the sweater is still a bit too big for him – it turned out bigger than I thought, and he’s a fairly small little dude. I got to hang out with him last night, which is what reminded me that I haven’t posted any of these. The yarn is some random stuff mum sent me after cleaning out her craft closet. Ravelry page for this one. 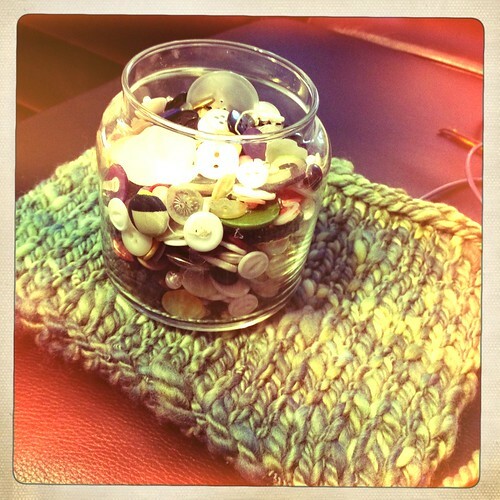 I mixed and matched the buttons from my button jar. This one was for a little girl named Ida, born in January. I love this little tiny pattern! 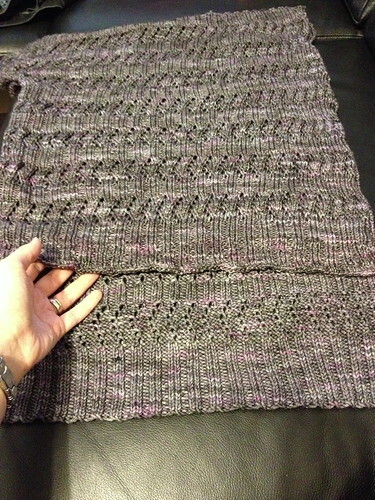 I think I’d actually make this one again, despite my loathing of the seed stitch on the front. 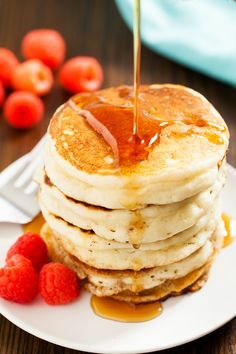 The little bumpy sleeves are so cute! 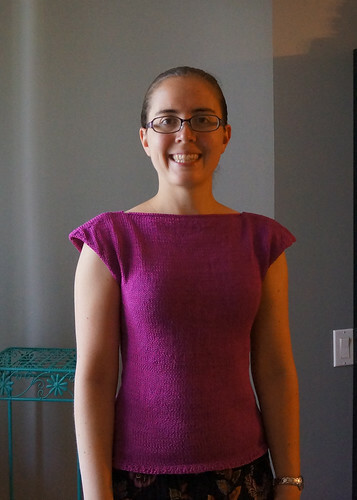 This one was a super-quick knit on a deadline – I wove the ends in about an hour before I gave it away! Again, buttons from the button jar, but at least I had 4 matching ones! They were cute when I gave it to them – I gave it a couple months before the birth, and the dad said ‘THANK YOU for CLOTHING our CHILD!’ they didn’t have any clothes yet. Ravelry page. I got this yarn in a swap. This one’s wearer isn’t born yet. He or she is due in May I think, but because the last two were on such quick deadlines, I thought I’d get ahead of myself. 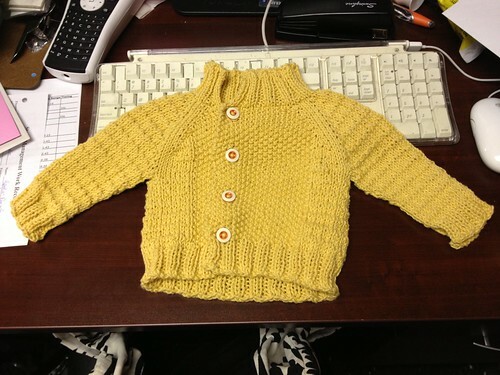 This sweater will be too big for a newborn, but a baby born in summer won’t need a sweater for a little while, so I made it in the 6-month size. Buttons from the button jar, more yarn from mum’s clearout. Ravelry page. So way, way, waaaaay back in the day, I decided I was going to knit my husband socks for our wedding. 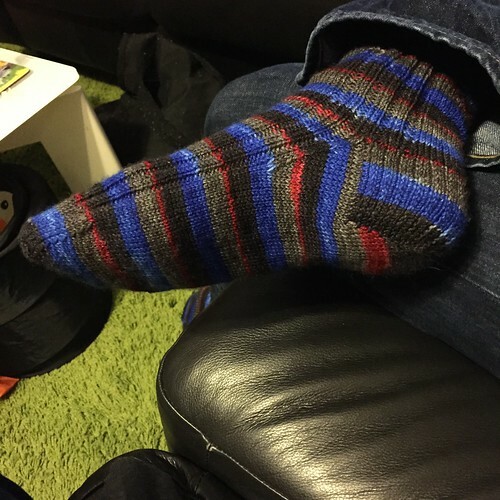 I ran in to a few roadblocks (I needed to get him to try them on more, not knit a whole sock then find it doesn’t fit) so I didn’t end up finishing them. They sat in a bag, taunting me for a long time. Every now and then, P would mention his ‘wedding’ socks. 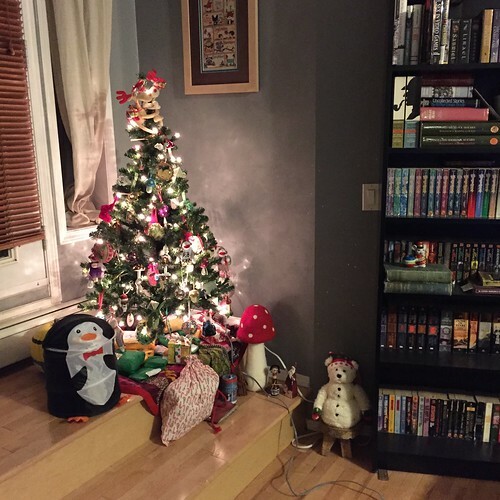 This Christmas, I decided to do something about it. This plan was also partly because of his new student status, and our lack of funds to actually buy each other things for Christmas. 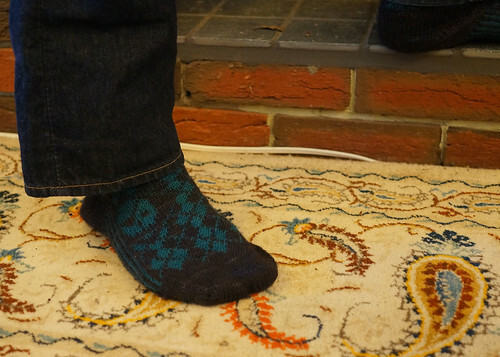 They were still a wee bit big on him – I usually like my socks smaller than my feet, so the stretch and hug a little. 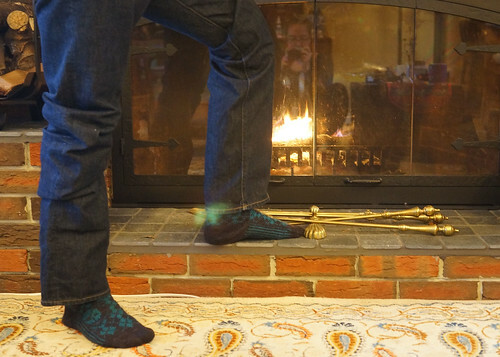 These I think were the same dimensions as his feet, so he wore them around the house as slipper socks. Sadly, a week ago, he brought them to me with a GIANT hole in the foot. “I’m so sorry, I don’t know what I did, I just wear them around the house, never in shoes!” Of course, not his fault at all, but I’m a little puzzled about how quickly they wore out. I’m going to knit him a pair of plain ribbed socks next, and see how those wear. He did love his skull-gyle. I’m in this photo! Christmas by the fire at my parents’ house. 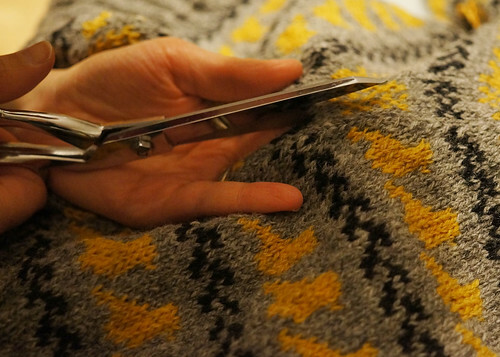 For the non-knitters out there, steeking is when you take a pair of scissors to your knitted project, on purpose. Why would you do that? 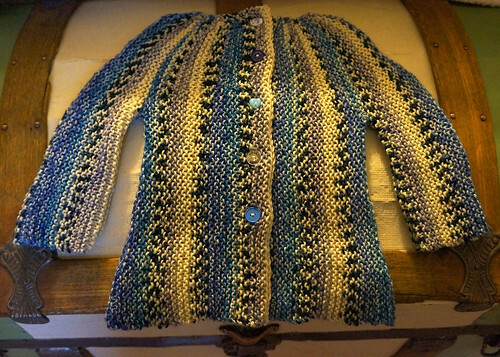 Well, take for example a colourwork (not striped) cardigan. It is much easier to knit colourwork as a tube of knitting. The thing is, cardigans are flat, pullovers are tubes. 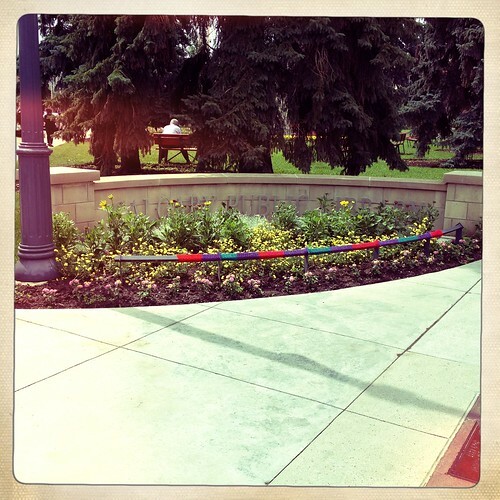 So some knitter, somewhere, rather than face purling with two colours, decided to just chop up their knitting. And it worked. It is plenty stressful, bu rewarding when it works. The scary thing (for me) was that I couldn’t try the sweater on as I went, because it has a deep V-neck. 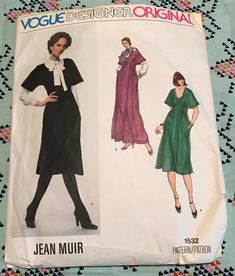 Imagine sewing the two sides of the neck of your deepest V sweater together. You couldn’t fit your body in there now. I was just doing it backwards. Luckily, it worked out. I started this sweater (Little Birds by Ysolda Teague) in September, ran out of grey in November, put it in time out for most of December, then rushed through the first week of January to finish it before my trip with mum. I really like it, and it fits well, although I do feel I could space the buttons out a little more to get it the tiniest bit tighter in that area. But still, a very successful knit, that I’ve already worn to work (the office, not the theatre) once. The temperature in the theatre was somewhere sub-zero for the whole time. I at least get to stand up and walk around, so I was only wearing a few sets of layers. Poor Amy has to sit at the desk the whole time, so she was wrapped up in hoodies and blankets and scarves and my old Endpaper Mitts. I lent her those ones for the two weeks, and worked on these ones as fast as I could backstage. I finished them just in time for opening. 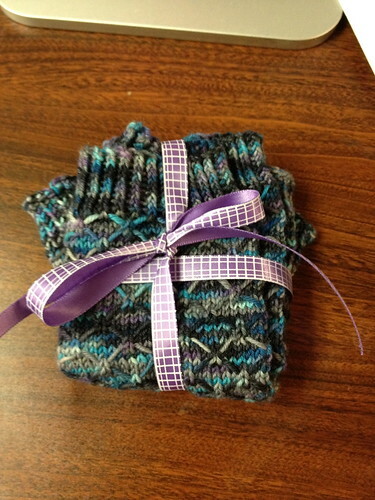 This is some deep stash – I bought it at Sock Summit 2009! It is from Black Trillium Fibres*, and I still have a fair bit left. 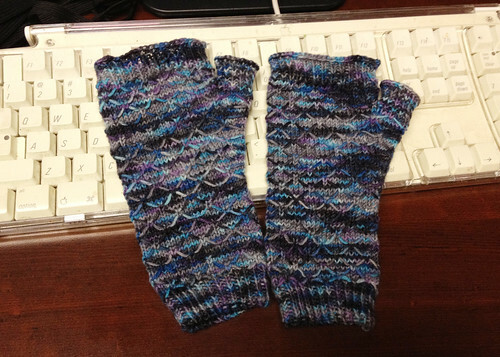 I could do a short pair of socks, or some longer mitts I think. 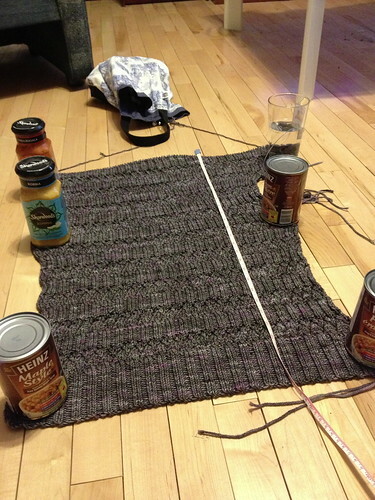 They are also a Harry Potter House Cup project… if you thought knitting was geeky, don’t even ask. *I just realized that this is an American-based indie dyer who actually spells fibre fibre! I knew I loved her stuff for a reason. The holiday season is just over 3 months away… are you ready? I love Ravelry. I love it for so, so many reasons, but my favourite right now is being able to connect with people. 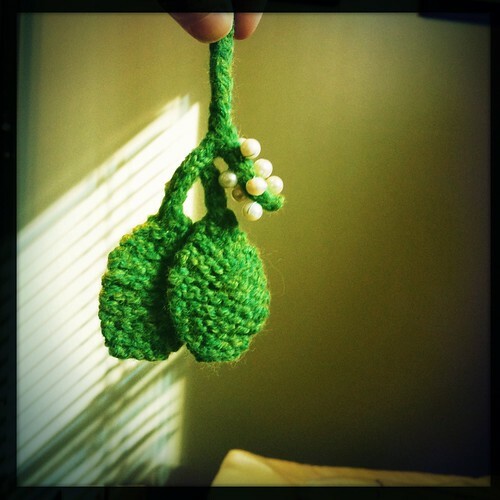 I’m in the Cookie A sock club, and I love the apple/green tea green yarn that came in this month’s parcel. I loved it so much, I wanted to make a sweater. One of my favourite hoodies is this exact same green, but in fleece. Luckily (for me) lots of people don’t seem to be fans of crazy-bright green. I just posted in the club forum that I’d be willing to trade yarn from my stash for more green, and got quite a few replies. Each of the three skeins on the left will be going from my stash drawers to a new home, and I will be getting 3 more skeins of this beautiful yarn, plus a pattern from one trader, and $20 from another (the last two things make up for price discrepancies). 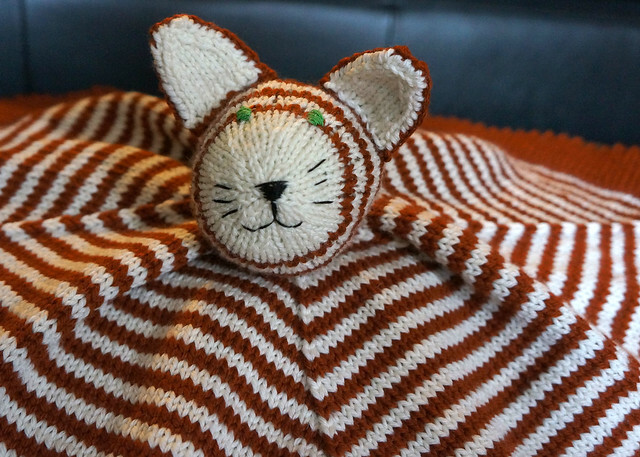 There are just so many reasons to love Ravelry! That’s a lot of knitting! I have two colours because…. well I don’t remember what I bought the yarn for 4 years ago, but I bought two skeins of pink and one of white. I do remember that I bought it at Olds Fibre Fest though. 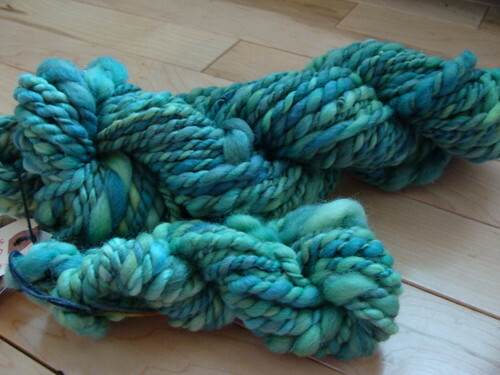 The yarn is 100% silk, but the rough silk, not the slippery stuff. The sweater looked great when I finished knitting, then I put it in the sink to block it. After 10 minutes, the water was pink, and so was the white part of the sweater. Small freak out, pull it out, assess damage. Pink blotches all over the white. No good. It was late at night so I laid it out and slept on it. (No, I didn’t sleep on the sweater, I slept on the idea of what to do next!) The next morning I did some research and found that something called Synthrapol is apparently good about getting excess dye out of things. Tracked some down at a nearby art supply store, gave it a bath in some water laced with marvelous new chemicals. It didn’t remove the blotches. What I don’t know is if having Synthrapol in the water in the first place would have helped. I gave it another bath, and although the pink kept leaking, I managed to spread it evenly over the white. Then a soak in some vinegar water and I laid it out to dry. So while the sweater isn’t ruined, it isn’t a pink and white sweater any more, it is pink and lighter pink. 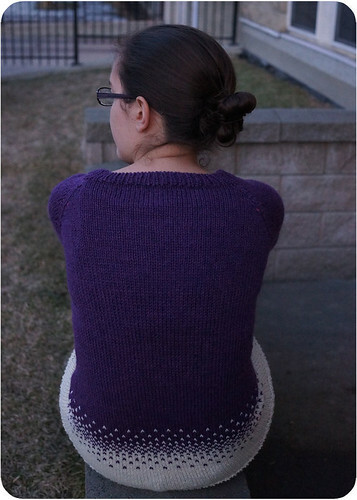 It feels a little large in the shoulders, the back line of the raglan sleeve always wants to creep over my shoulders to the front of the sweater, but I think that is more from stretching out in all the various baths I gave it. 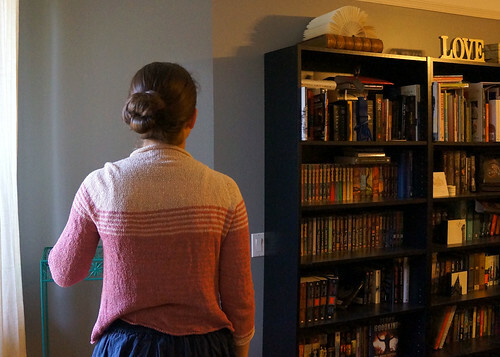 The sweater pattern is Adrift, and there are more details on my Ravelry page. I like blanket-y sweaters like this for work, because I can wrap up when I get cold. Oh this old thing? I made it myself. I’ve finished some knitted objects recently! It feels a little novel to finish things. I feel like I haven’t actually finished anything in ages. That’s a bit untrue, as I finished the woobie cat in May, and my Colour Affection, the iPad cover and lots of little things for swaps and other people. 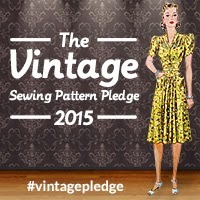 But recently I’ve finished two garments, both for me! Saying they’re for me is a bit redundant – garments take me so long that I only ever knit them for me. Deep V and peekaboo cables in the back (this is where ‘Hot Lips’ kicks in). 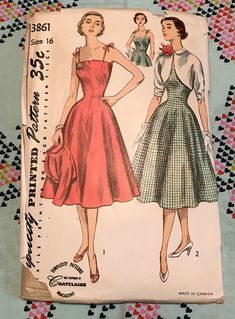 I loved the pattern because of the lines of the shaping, you can see them in the photo pointing in to my waist from the bottom, and heading outwards from waist to bust above the waist. Turns out, the pattern as written did not make the increases/decreases do that. I basically had to re-invent that part. 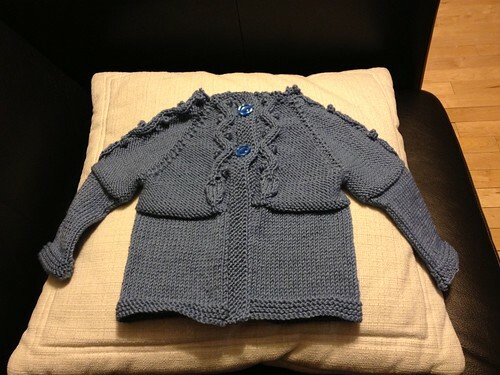 All the details of what I did are on my Ravelry page. 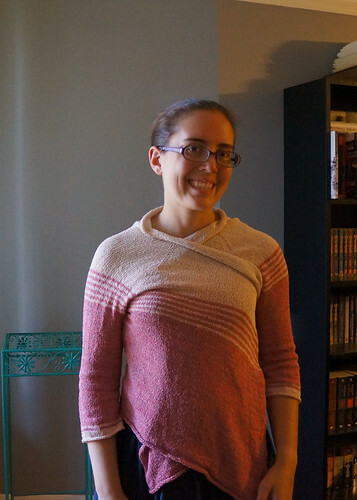 I love the finished sweater, I’ve already worn it to work and gotten lots of compliments (the more astute coworkers remembered me knitting it at the reception desk!) but I wish I didn’t have to do so much thinking and re-knitting to get the same finished object as in the pattern photos. This project used up yarn that has been in my stash at least 3 years, probably more like 5 years, so it felt really good. I wasn’t sure if I wanted a one-button closure, or more buttons, I let what I find dictate that. I chose two buttons, and sewed them on and made the button loops from some matching green Cascade 220 I had lying around. Good thing I like green! No seriously, I really like green! 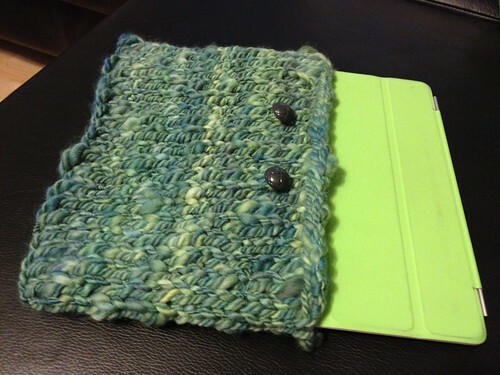 Does my iPad need a cozy? Probably not, but it was a very satisfying knit, and even that little break from the laceweight sweater has put wind back in my sails for that project. 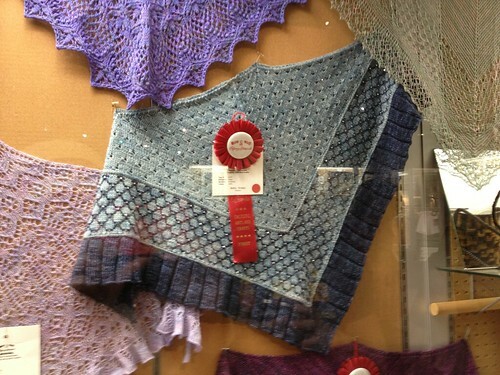 Two years ago, I knit the Evenstar shawl specifically to enter in to the Creative Arts & Crafts competition at the Calgary Stampede. Last year I was eaten up by wedding planning/wedding blogging so I didn’t even try. 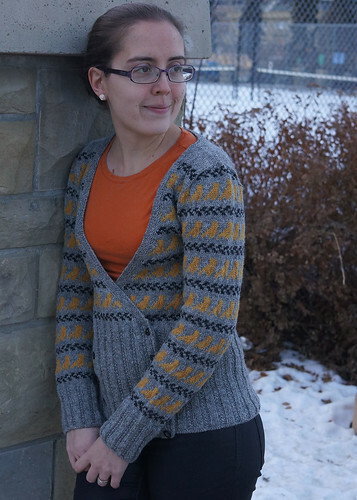 This past year I knit what I wanted to for me, then when Stampede time rolled around again, I had to look back and figure out what, if anything, I deemed worthy. 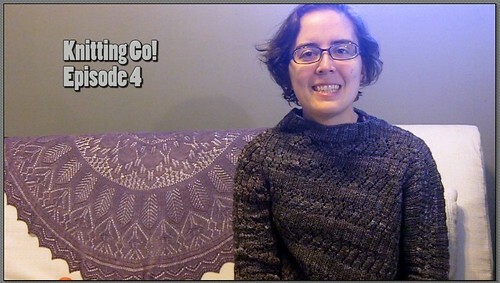 I decided that the best thing I’d knitted was my not-going-to-Rhinebeck sweater. Last Friday the husband and I were on the grounds to catch an Our Lady Peace concert, and I made him look around the knitting displays first. Third place! 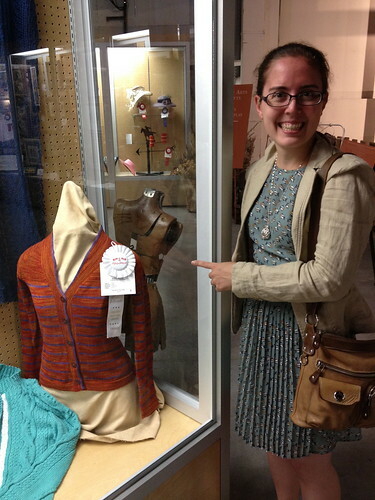 Sadly, not Third in in the whole Knitting section (that would mean $100!) 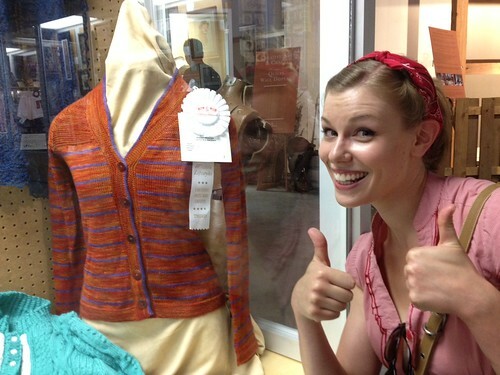 but 3rd in Stockinette/Garter stitch sweaters isn’t too shaby! 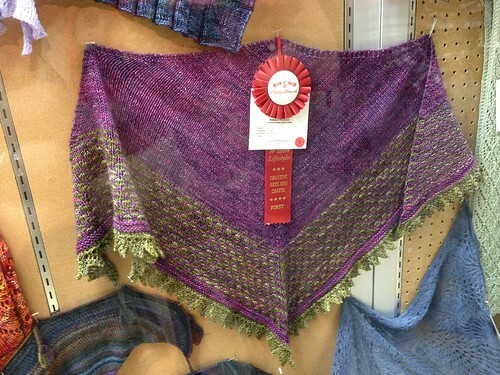 The awards are tiered like that – the top 3 knitted things out of all the entries get 1st/2nd/3rd in Section, plus cash prizes, and then the top 3 things in each class (lace accessories/stockinette sweaters/etc) get ribbons. I had to explain that to a non-knitter lady who was there taking pictures for her knitter-sister and texting her that she won $125. I felt bad, but figured it was better to tell her than not. I love both these shawls, but don’t know the patterns! The pictures aren’t the clearest, what with iPhones & the glass cases, but I thought I’d throw it out there. The purple/green was in ‘Stockinette/Garter Stitch Accessory’ and the blue was in ‘Embellished Item (knit with beads, sequins, etc)’. The beads are on every cross of the lattice section. 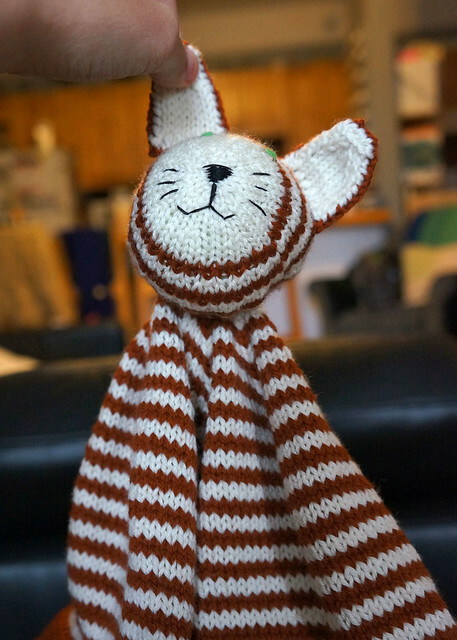 One of my coworkers is pregnant, and as we were working on CATS together, I just had to make the baby a knitted cat. 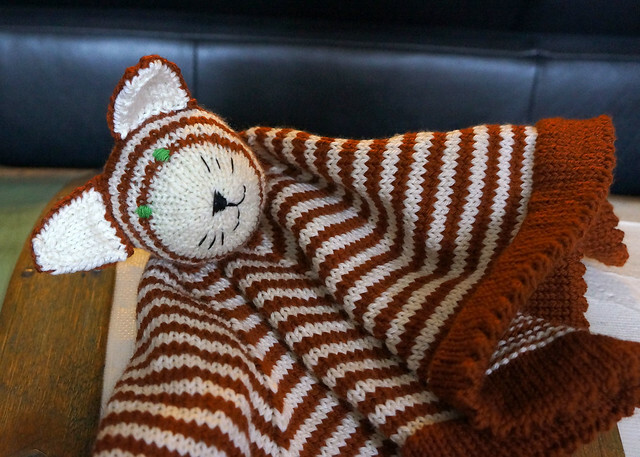 I found this pattern for the Woobie Kitty on Ravelry, and ended up buying the whole e-book of ‘woobie’ patterns. I want to make a zebra for the next person I know who gets pregnant! Embroidering the face on straight was very hard! In the end he’s a little cockeyed, but it just adds to the charm, yes? 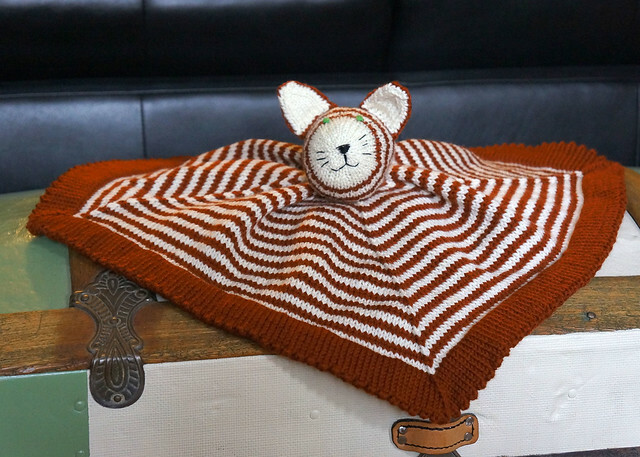 When I ordered the yarn online, I thought the brown was going to be more of an orange, because I wanted to make a green-eyed orange and white cat. It’s more of a brown and white cat, but the eyes are still green. I made sure to sew on the ears as well as I could, and then I gave it a few test swings around the room. Turns out that you can swing a cat in our 900 sq foot condo! I love the floppy body, I think it will make a great toy for a kid. They could curl up under it, drag it around by one corner, turn it upside down and hold things in it, sleep on it… I think it’s an original and versatile shape. I used the recommended yarn (Cascade Superwash Sport), and bought the recommended amount (2 skeins orange, 1 white). The picot hem for this thing used one whole skein of the orange! I was worried I’d run out, but there was plenty of yarn. *I call the baby ‘Baby P’ here… the P stands for Pubert. Whenever my friend gets asked what the baby’s name is going to be, she says ‘Pubert. Or Skillz.’ so people stop asking. We think that the cat should be named Pubert though, so fast-forward 3 years when the family is running through an airport somewhere with a child screaming ‘I WANT PUBERT! WHERE IS PUBERT?!!’. I found that funny, anyway. I finished something I was knitting! Cue the confetti canons! 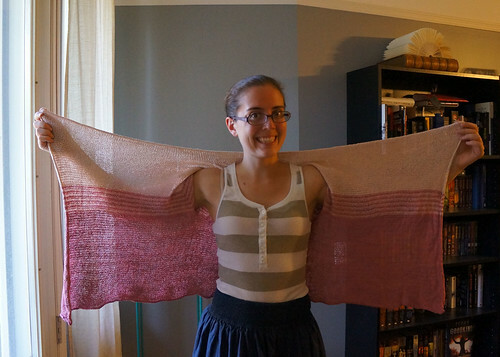 I started knitting this shawl on our honeymoon. I hemmed and hawed for a while about what project would fit my needs for honeymoon knitting, and once I decided on Veera’s Colo(u)r Affection, I hemmed and hawed about whether or not I should take the third colour with us. We were packing light, but I didn’t want to knit more than I expected and then be stuck with a knitting project I couldn’t knit on anymore in the middle of our Costa Rican vacation. In the end, I brought colour #3, and I did end up using it, if only on the plane home. We arrived back here about 9 hours before I started a crazy two months at work, so it took a while to finish it. It didn’t help that the stitch count got up to over 400+ stitches on each row. I had to do the bind-off in two sittings! I bought the yarn in a kit from the Plucky Knitter, in the “Careless Whisper” colourway. I gave it a good soak in some warm water with some Eucalan, then laid it out to dry. 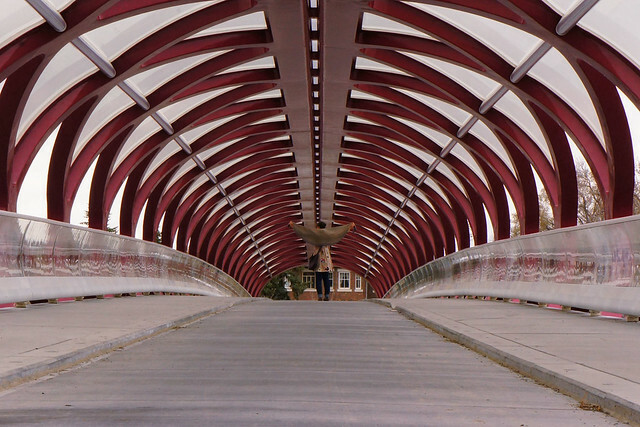 Then, I made P take a walk with me out to a new bridge in town (verdict: I think it is pretty, I think it is useful. Good job, city council!) to take some photos of the finished shawl. I also made sure to wear the coat I had in mind while knitting it. I realized after looking at all the pictures that one of my favourite things about this coat (apart from the full skirt and the pansies) is the corset back, which the shawl covers in all the photos of my back. oops! I waffled for a while about whether or not to include a YO in the first two edge stitches to give the edge a bit more elasticity. Some projects on Ravelry mentioned it, some didn’t, one said it made it too loose. In the end I decided to knit it as written. I figured that the designer would have thought about that, and noticed any tightness in the samples. I had a few moments of worry while knitting (“it’s feeling a little tight….”) but after a good soak I was able to stretch it into just the shape I wanted. 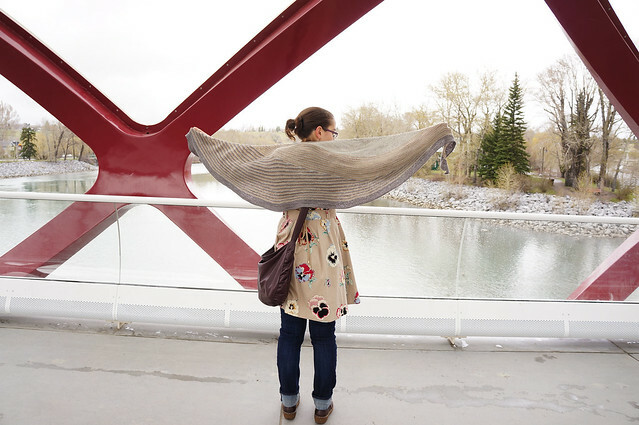 This shawl isn’t a straight line across the top, it curves slightly to sit on the shoulders. If adding in a YO would have taken that away, I’m glad I didn’t! Wishing some magical knitting fairies would visit in the night, and sneak a few rows in on your current project. Looked at my chart – 2 little hash marks, which meant I was still on repeat #3. 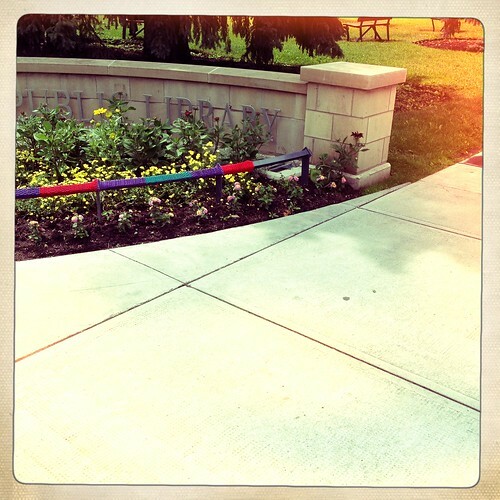 Looked back at the knitting – it looked longer than that. Counted rows completed by counting the nubs on the edges. Re-counted the nubs on the edges. Counted the zig-zags in the middle, just in case I’d gotten the border chart mixed up and had done too many nubs. And in that instant, I was suddenly one row away from finishing repeat #4! One row later, and I was working on repeat #5 of 6! I managed to stay in on Monday the 23rd, and forgot a photo on the 29th, but it was a pretty great week this week! Lovely and warm, as you can see by the complete lack of hats for the week. 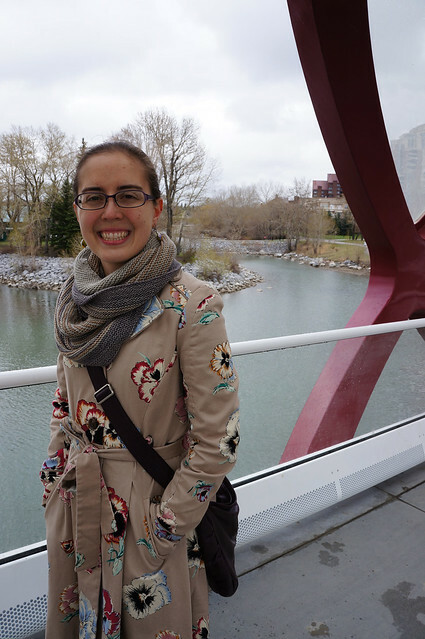 Things to note: Jan 23 & 24 – no woolies, just my new favourite black work sweater! Jan 26: A rare photo of me wearing both mascara and lipstick! It was opening night that night, so I wore those two bits of makeup, and painted my nails ‘Break a Legwarmer’ grey by OPI. 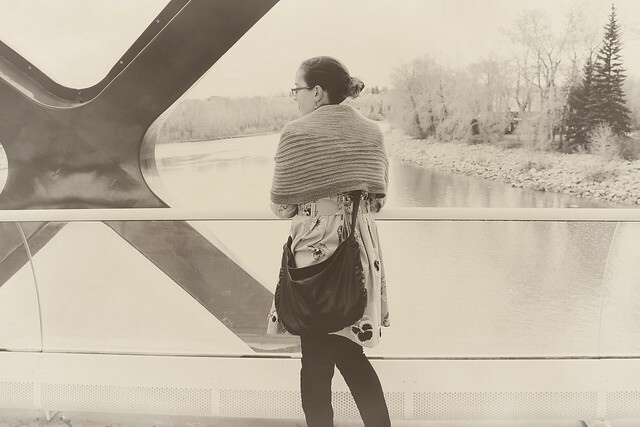 The gorgeous pashmina/shawl thing is from Anthropologie, and was a Christmas present in 2010 from mum. Jan 27: You don’t need a hat in this weather if you have a hoodie! So as you can see, when it gets warm, you don’t see the knitted items. 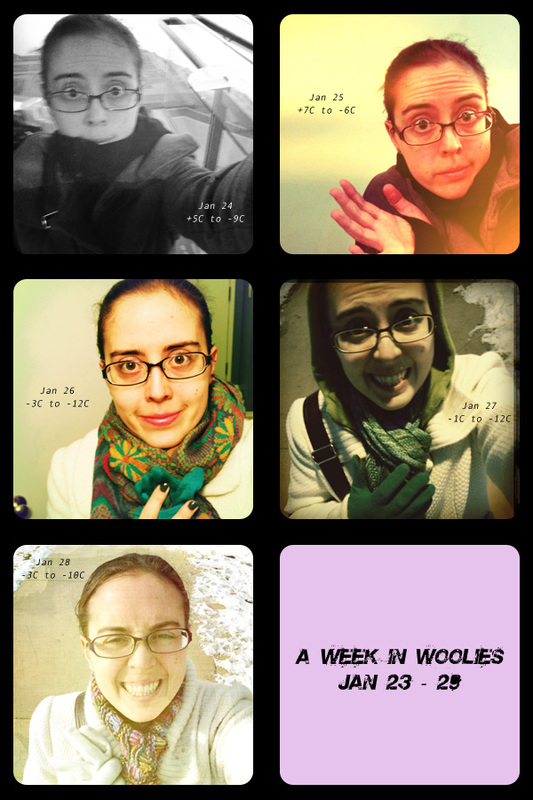 In that 5-day collage, I wore my Clapotis once, and Teale’s scarf once. Otherwise, nothing. I think I need to make myself a thinner pair of mittens, because I was still wearing gloves on those days, but both pairs I have already are super-thick, and featured in last week’s post, when it was much colder, and you could barely see me for all the layers. But that’s winter in Alberta. -40C one week, +4 the next. 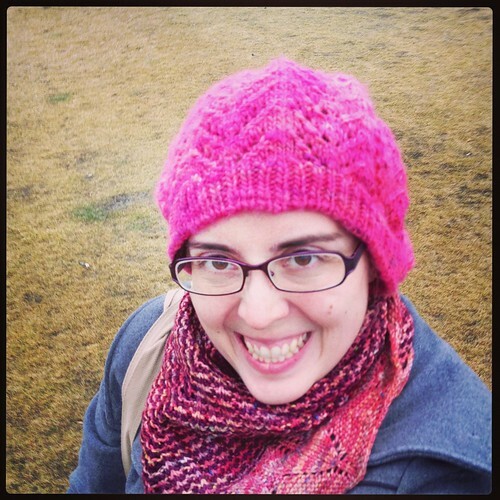 Have you been documenting your winter wear? Let me know!